A tinted window is equipped to block thermal rays which can overheat the interior of a car. A thermal rejection film allows a driver to remain cool while driving without the usage of AC. Even though most car windows fail to block UV rays, many of us fail to apply sunscreen before a long drive in the sun. UV rays from the sun can be dangerous and may lead to sunburns and skin cancer. UV blocking window tint has the ability to block 99% of UV rays. This means both your skin and eyes will be protected while driving during the daylight hours. The suns rays are not only harmful to people but also yo upholstery. UV causes color fading on different materials like cloth & carpets; leather can be damaged especially fast by the sun. Tinting your car windows is by far less expensive than re-upholstering your car. When windows are tinted, they become harder to break. While accidents do occur, you should know that when a tinted window manages to be broken (by extreme impact), shards of glass will remain attached to the film. This is beneficial for two reasons, 1) In the event of an accident, your window will remain in place, lessening the chance of any glass related injuries and 20 in the event of a robbery, a thief will have an extremely difficult time when trying to break into your car through the window. A car with tinted windows will be avoided by any thieves who know what’s good for them. You can and should protect your eyes from the blinding glare of the sun. Stop squinting your way down the road and make an appointment to have your windows tinted today. Tinted windows allow you, your passengers, and your valuables the comfort of privacy from outside viewers. Tinted windows protect the contents of your car from burglars or strangers while also keeping all eyes off of you and your passengers while traveling. 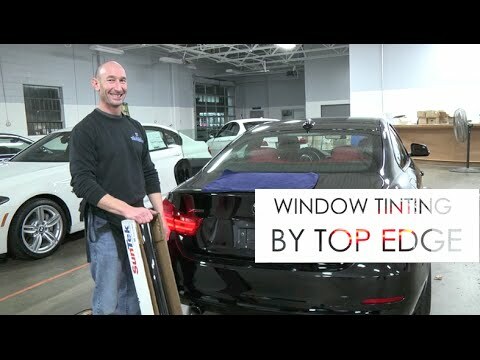 Get started on your next car window tinting or paint protection film project by talking to the experts at Top Edge Window Tinting!